History: 60 year old male with flank pain. 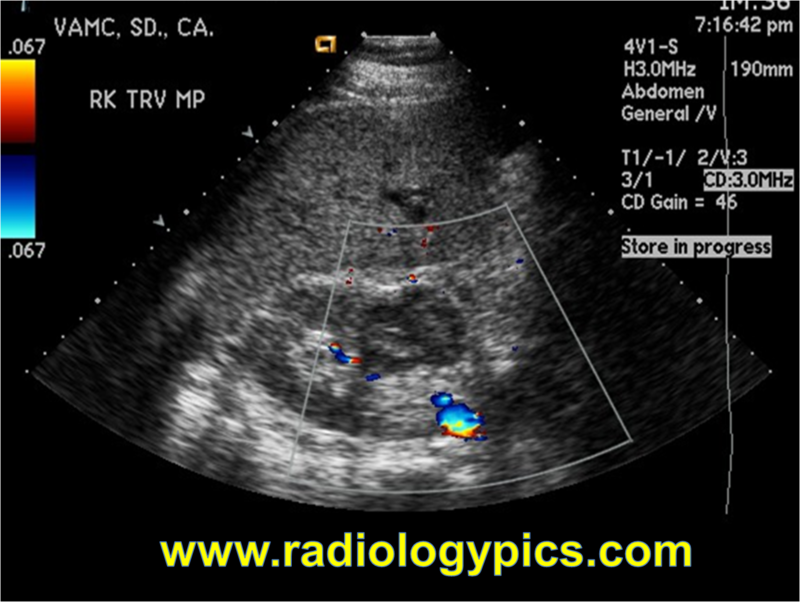 Multilocular Cystic Nephroma: Doppler color ultrasound of the midpole of the right kidney reveals a lobulated and multiseptated hypoechoic mass with no internal vascularity, which is typical for a multilocular cystic nephroma; however, not specific. This is a multilocular cystic nephroma, which is a benign cystic neoplasm of the kidney classically seen in young males and middle aged females. Multilocular cystic nephomas commonly herniate into the renal hilum. It is impossible to distinguish multilocular cystic nephromas from malignant cystic tumors on imaging tests. The differential for this appearance on ultrasound (not specifically for this 60 year old male) would include cystic malignant neoplasms of the kidney such as cystic Wilm’s Tumor or cystic renal cell carcinoma, as well as multicystic dysplastic kidney and mesoblastic nephroma in neonates. A renal abscess is not likely, given the lack of markedly increased vascularity surrounding the mass. On CT, multilocular cystic nephromas are classified as Bosniak type 3 lesions and must be surgically excised for definitive diagnosis. See this patient’s CT of the abdomen showing his multilocular cystic nephroma. This mass was stable for 5 years before excision.